Sasha’s birthday extraveganza. Night one. Fresh seafood medley. So we trundled up to a beautiful cottage near Bombah point on the Myall Lakes aptly named Bombah eco retreat for wining, dining and general relaxation. I organised a menu fit for a special birthday treat and we swung by the fish markets on our way out of Sydney and stocked up on great fresh produce and wine. We were a little hungover from the previous nights celebration so I kept the first night’s menu pretty simple with minimal cooking. 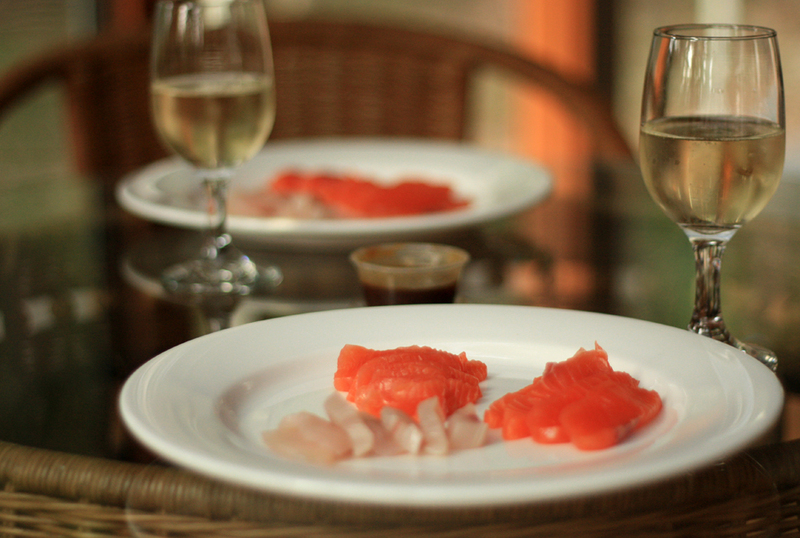 Starter was fresh salmon and kingfish sashimi with wasabi soy. Stick it on a plate and hey presto. Course one is done leaving more time to pop the champagne cork and enjoy the eating. Round two was oysters done three ways. 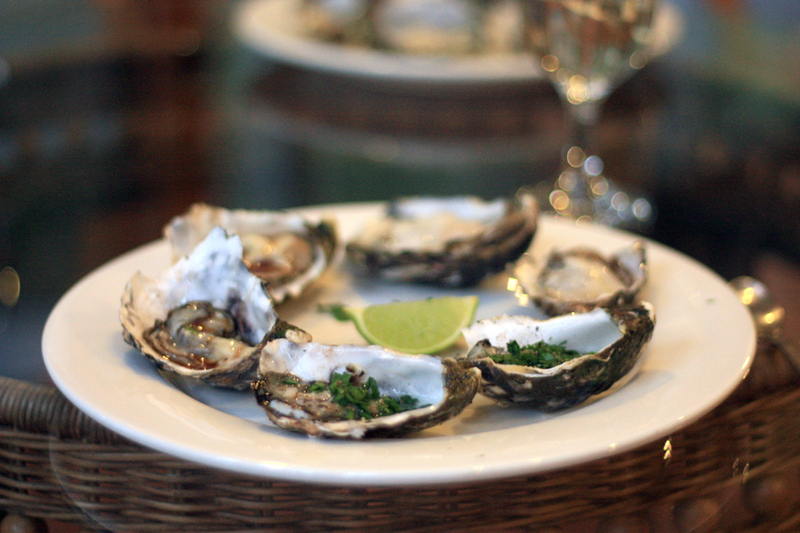 Our delightful hosts at Bombah cottages has a plentiful herb and vege garden so I took advantage of their abundance of garlic chives and parsley and made oysters with finely chopped garlic chives, parsley and lime juice, oysters with wasabi soy and oysters natural. The garlic chives and parsley was my favourite. A combination I will definitely do again. 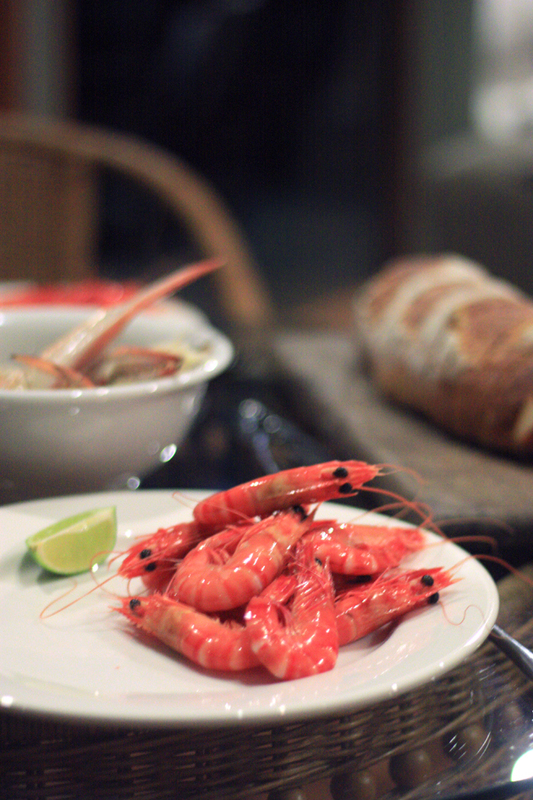 Round three involved fresh cooked prawns, blue swimmer crab, seafood sauce and beautiful fresh sourdough. I usually make my own seafood sauce and probably much to my mother’s disgust I bought some from the fish markets. On tasting some they had on display I concluded it was absolutely delicious and saved me making my own up in an unknown kitchen. All in the all the meal was a winner eaten at a leisurely pace over a number of hours, after which we jumped in the spa and promptly fell fast asleep 5 minutes into the movie we put on… and slept like babies. Pure bliss.